Money services businesses, a broad category of nonbank financial institutions running the gamut from brick-and-mortar money transmitters, check cashers and currency exchangers to more modern e-wallet and prepaid access providers and bitcoin exchangers, provide millions of Americans with financial services they cannot receive from banks. Banks have become the primary MSB industry regulators, a role they neither desire nor can fulfill. Even for MSBs with the required state licenses and Financial Crimes Enforcement Network registration, banks hold the exclusive authority to decide which MSBs live or die, and exercise this authority without due process or standards comporting with the rulemaking requirements of any first-world jurisdiction. Many longstanding MSBs have ceased operations because of a lack of access to banks. Startups offering digital and virtual solutions for their customers have failed for the same reason. All of this leads to fewer choices, poorer service and higher prices for MSB customers. Some MSBs have clouded the nature of their businesses to open bank accounts, defeating the banks’ anti-money laundering programs. By deceiving banks, numerous MSBs have committed federal felony offenses and been criminally prosecuted. In other cases, as recently reported by the Wall Street Journal, money transmitters have been forced to fly cash-filled duffel bags to Dubai for distribution throughout the Middle East and Africa because banks in the U.S. have ceased providing accounts to MSBs serving the African diaspora. Rather than allowing these transfers to occur bank-to-bank and under the U.S. government’s watchful eye, the banking crisis has driven huge volumes of money underground, benefiting none more than the international black-market financial system. As simple as the problem may be, the solution requires the full buy-in and cooperation of regulators, banks and the MSB industry. While various domestic and international governmental bodies — including Financial Action Task Force, Federal Financial Institutions Examination Council and FinCEN — have made clear that banks can and should service the MSB industry commensurate with their anti-money laundering responsibilities, these announcements are not binding on the agencies regulating banks or the agencies’ employees and examiners. Without consistency in these announcements, banks will remain concerned about inconsistent enforcement, and continue making financially motivated business decisions to stay away from MSBs. But blaming banks for the banking crisis accomplishes nothing. They have only recently emerged from a historical era of government enforcement with billion-dollar fines stemming from unsafe, unsound and/or fraudulent business activities. No wonder they want to avoid high-risk accounts. If banks should be criticized for anything it is lack of vision or a failure to recognize the benefits MSB clients bring. 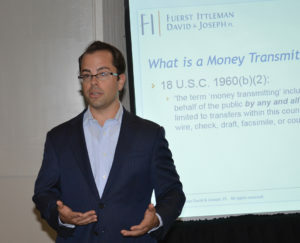 In addition to dealing in money as their inventory and often being required to maintain sizable cash deposits to remain compliant with state licensing laws, MSBs have access to advanced financial technology, customer bases, and international partners that could benefit US banks suffering from a generational shift in trust and goodwill. So, who should take the lead in this issue? Without a doubt, the MSB industry — and with a single voice. Among other critical issues that the industry must continue to champion is how MSBs can support law enforcement and anti-money laundering initiatives, encourage financial inclusion and accelerate international commerce. The International Money Transfer Conferences (IMTC) are an excellent platform for this discussion, and hopefully the conferences continue to expand. The Money Services Businesses Association (MSBA), which I helped create with key members of the industry and other MSB attorneys and consultants, also provides a valuable resource and platform. Through these combined efforts and ideally with the with the help of the international banking community and its regulators, MSBs will soon find banks that wish to have them as customers. Hugo is a writer, a conference speaker, a conference/event producer, an inquisitive panel moderator and an opinionated money transfer consultant and mentor with vast experience. who speaks English, Spanish, French and who loves to run, swim... and walk over long distances. Digital vs. Cash, are we getting it all wrong?